Time: Total 3-1/2 hrs – 1/2 hr to trace out, cut and sand for painting. 1-1/2 hrs to paint the colours. 1-1/2 hr to paint the black lines. This first step was to trace out the perimeter of the pattern onto plywood. Using a large sheet of tracing paper makes quick work of transferring the pattern to the plywood surface. I used a jig saw to cut it out. If I had my time back I might not have cut away the plywood between the legs, simply to provide some extra stability to the project . I added that comment to the plan for customers. At this point the project could start to be painted. I like to experiment and change up woodworking plans as I go. So I looked at the pattern is decided to give it some depth. To do this I choose parts of the pattern that I though would stand out when thinking in 3 dimensions. Like the hair, eyeballs, teeth, arm and pants. Its also a good way to make use of the left over odd shaped pieces of scrap plywood. 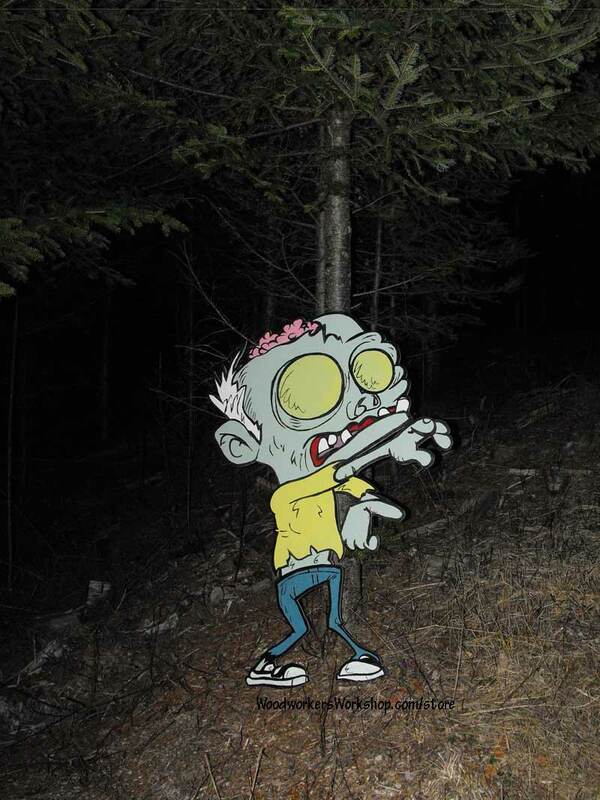 Giving the zombie some 3d effects using a layering technique. Now its time to prepare the plywood for painting the colors. After a quick sanding and dust off, I prepared some grey paint to act as a base coat for most of the pattern (skin, clothing). Other parts that are to be a white or semi-white color I base coated with white. I used paints I had on hand, like some white deck stain. Its the ideal paint (yes its a stain but it acts like paint without the effects of peeling) to use and I always have primary colors on hand. For the grey I simply blended some white and black together (mostly white, a little bit of black). The parts that will be used for layers. And the light blue I can probably darken with a bit of black deck stain. I have red (somewhere) and can lighten that with a bit of white to make some pink. Combing exterior stains with exterior paints. Or, I could just decide to use different colors. I do like the grey that is currently on the wood. A zombie can have grey skin, right? Its a deathly color too! Now just waiting for the paint to dry. I’ll update the post as I progress. Next was the task of tracing some of the outlines for the major parts like the hair, brains, shirt, flesh, pants and shoes. I did not follow every outline, I simply traced some of the areas to give me a good idea of where to start and stop painting. The thing to remember here is that afterwards, the final color will be the black lines which is perfect for hiding mistakes. Tracing outlines for the zombie. I took some of the dark green paint I had on hand and mixed it with some white paint. Since I wanted a light green, the mixture was mostly white with a little bit of green. Creating a custom zombie flesh green color. After a first coat of green and some additional white to create the teeth, time to let it dry. The great thing about acrylic paints is they dry fairly fast. The zombie is starting to appear form the greyness. Now for a touch of pink for the exposed brains. I mixed together about half and half white and red paints to get a bubble gum color. Zombies exposed brains! And a touch of blood red for the gums. First coat of pant and shoes paint. 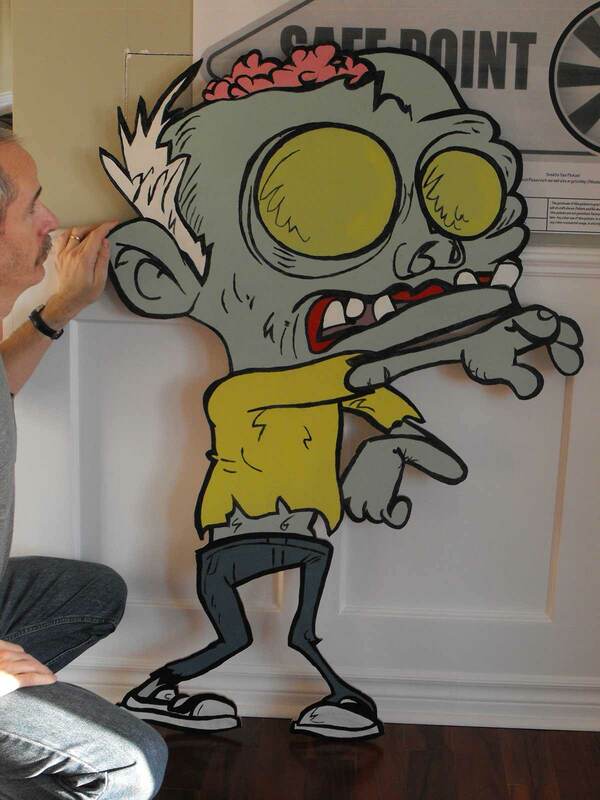 Putting the final coats of color on the zombie. Final color on the zombie shirt. All that’s left to do now is paint the black lines. With a little bit of paint form the shirt, I dry brushed the light shirt color onto zombie eyeballs. You will have noticed by now that I have not done anything with the cut out parts (the “layers”). I’m opting not to do them at this time. Zombie yard art project almost completed. We are getting close to being done. All the lines have been traced onto the plywood. Now its just a matter of painting the black. Positioned in the woods to scare away trespassers! Now when you look at that picture below you might think that is photoshopped, but its not. The lighting was just right. Beware all those who trespass our property! Beware of the shadow lurkers! Please feel free to post your questions or comments below.